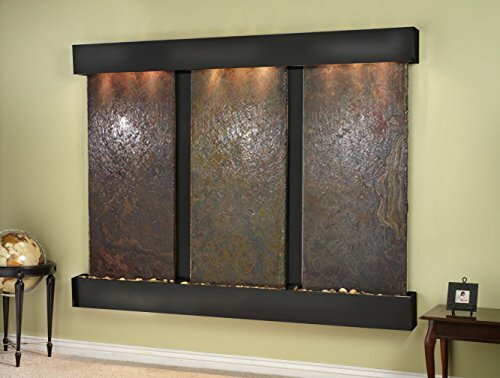 The 3 Stone Deep Creek Falls Collection is made in the USA by Adagio Water Features. A comforting and tranquil environment is the natural result of combining soft halogen lighting over the gentle movement and sound of water in motion. 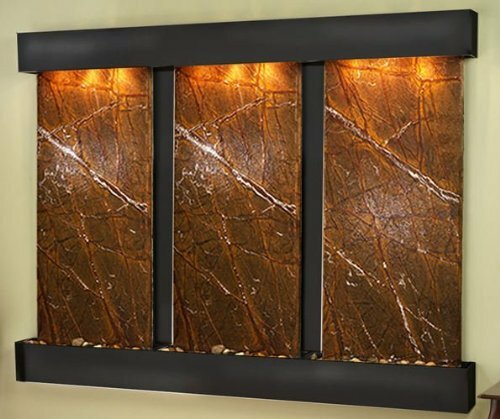 The Deep Creek Falls Collection features three faces available in Mirror, Featherstone, Marble, or Natural Slate. The Hood and Tray are available in Blackened Copper, Rustic Copper, or Stainless Steel with rounded or squared edges. 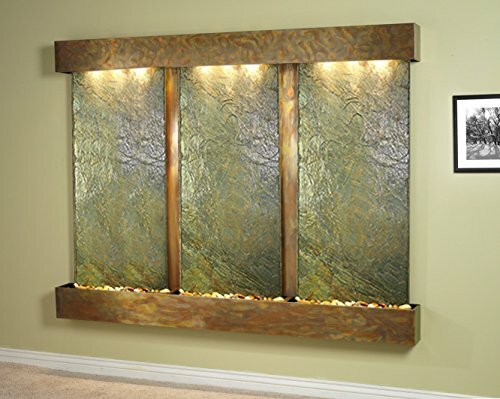 This vertical water feature includes polished river rock, halogen lighting, and water pump. The heavy duty tray liners are double tested to ensure a water tight seal. The adjustable splash guard (pebble beach tray) prevents splashing, hides the pump from view, and displays our pebble beach made up of natural polished river rock. 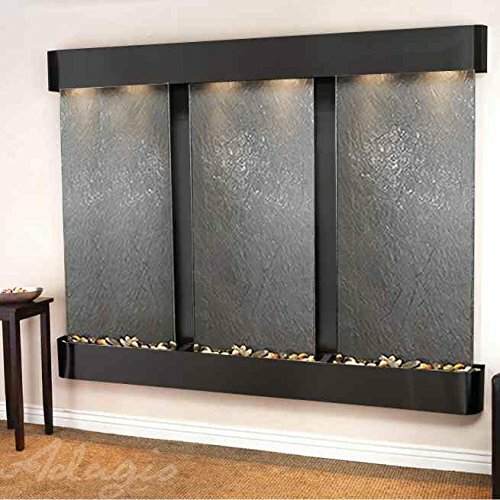 Create a stunning impact with this three face wall mounted water feature in your home, office, entry, or boardroom. 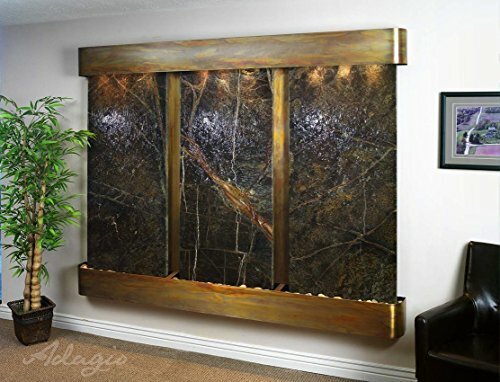 ADAGIO Water Features represents the best the industry has to offer. 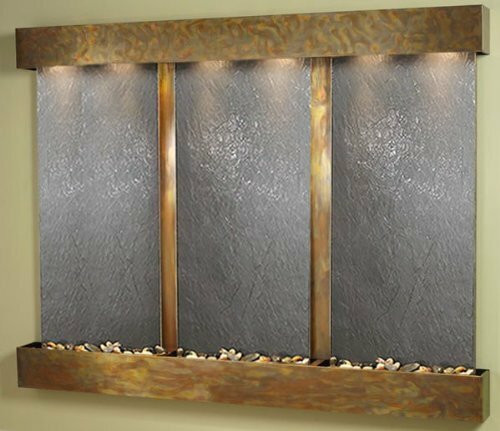 The Deep Creek Falls collection offers the tranquility and sound of water in motion falling over beautiful natural slate, mirror or marble. For the ultimate "wow" factor. Comes complete with polished river rock, halogen lighting, and pump. On/Off Pull Chain allows yo to run lights only, water only, or water and lights together. 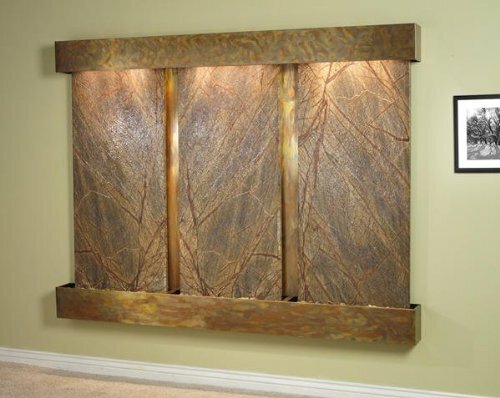 Dimmer Swith allows you to adjust the lighting to produce the desired ambiance. Comes with EZ Installation DVD and Printed Instructions. Perfect for large enty ways, lobbies and boardrooms. The Deep Creek Falls Collection is made in the USA by Adagio Water Features. A comforting and tranquil environment is the natural result of combining soft halogen lighting over the gentle movement and sound of water in motion. The Deep Creek Falls Collection features three faces available in Mirror, Featherstone, Marble, or Natural Slate. The Hood and Tray are available in Blackened Copper, Rustic Copper, or Stainless Steel with rounded or squared edges. 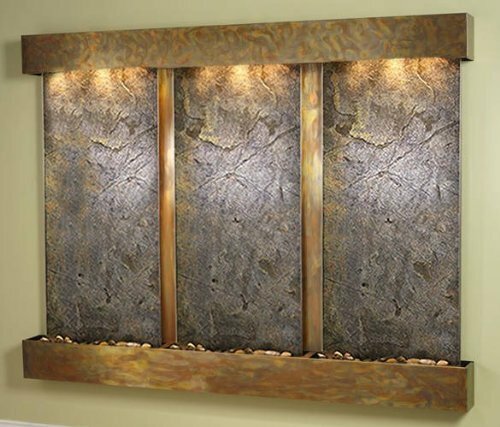 This vertical water feature includes polished river rock, halogen lighting, and water pump. The heavy duty tray liners are double tested to ensure a water tight seal. The adjustable splash guard (pebble beach tray) prevents splashing, hides the pump from view, and displays our pebble beach made up of natural polished river rock. 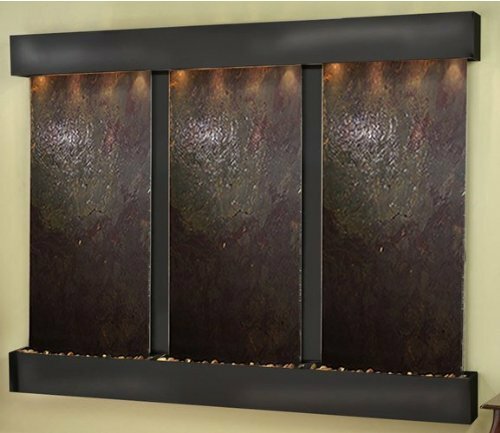 Create a stunning impact with this three face wall mounted water feature in your home, office, entry, or boardroom.